All three main hospitals in Southend, Chelmsford and Basildon are equally important to providing your care in the right place. All three A&Es will continue to receive people arriving by “blue-light” ambulance, 24 hours a day. If you live closer to other hospitals, such as Addenbrooke’s in Cambridge or Colchester General Hospital, in general you will continue to use those hospitals. For those times when you need the care which only a hospital can provide, you should have easier and faster access to the right hospital specialists for the best possible care, recovery and outcomes. 1. The majority of hospital care will remain local and each hospital will continue to have a 24 hour A&E department that receives ambulances. We would like to know your views on proposals to improve your local A&E – the development of an “emergency hub” at each hospital with a wider range of urgent care services, as outlined below. 2. Certain more specialist services which need a hospital stay should be concentrated in one place, where this would improve your care and chances of a good recovery. There are times, perhaps once or twice in a lifetime, when you may need the care of a dedicated specialist team. This may involve going further than your local hospital for three to four days, to get the benefits only a larger specialist team can bring. The teams in all three A&Es would be equipped and able to diagnose and stabilise your condition and initiate treatment. Of the 960 or so people that attend our A&E departments each day, we estimate that, as a result of the proposals we have developed, around 15 people would need a transfer to a dedicated specialist team in another hospital. If you needed to transfer to a specialist service, where you would have a higher chance of making a good recovery, we propose to invest in a new inter-hospital transport service with full clinical support, travelling with a doctor or a nurse for a safe and rapid transfer to the care you need. 4. Planned operations should, where possible, be separate from patients who are coming into hospital in an emergency. By separating planned operations from emergency admissions, we may shorten waiting times, avoid cancellations, reduce infections and improve your recovery. The majority of routine and daycase operations would continue at your local hospital, but we are proposing to relocate some services that need a hospital stay of three to four days. We estimate that for around 14 people a day, this would mean travelling to a different hospital. We would like to know your views on proposals to transfer services from Orsett Hospital to a number of new centres closer to where people live in Thurrock (for Thurrock residents) and to Basildon, Brentwood and Billericay (for residents of those areas). Only when new services are up and running, would it would be possible to close Orsett Hospital which, although valued by many local people, is difficult to access by public transport and is an ageing site requiring in excess of £10 million to bring the building up to standard. In local discussions over the period that we have been developing these proposals, many people have highlighted concerns about the feasibility of managing services across three hospitals and travelling between them. If needed, the A&E teams and specialists would work together and discuss with you and your family the safest arrangements for your transfer. Should it be decided that a transfer was not the right decision for you, the specialist team would support the A&E team to give you the best possible care. If you and your hospital team were to decide a transfer should go ahead, then you would only transfer if your condition was clinically stable, and you would have the support you need, including a senior doctor or nurse travelling with you, if necessary. Our proposal is to introduce a new type of inter-hospital clinical transport, in addition to the ambulance services that we already commission from the East of England Ambulance Service. Public transport routes between our hospitals are rarely straightforward. If your family or friends don’t drive, you could be separated from the people you rely on for support at a time when you need it most. We have taken these concerns very seriously and we are keen to do as much as possible to support families, in particular those who may be without transport or disadvantaged in some other way. We propose to help by introducing a free bus service between the three hospitals, or other locations that may be more convenient to you. We estimate that this will offer up to 60,000 passenger journeys per year, but we would review this regularly and increase the service if needed. Support for patients and families is high on the list of issues to address in planning service change. During this consultation we will be listening carefully to more of your views on this. 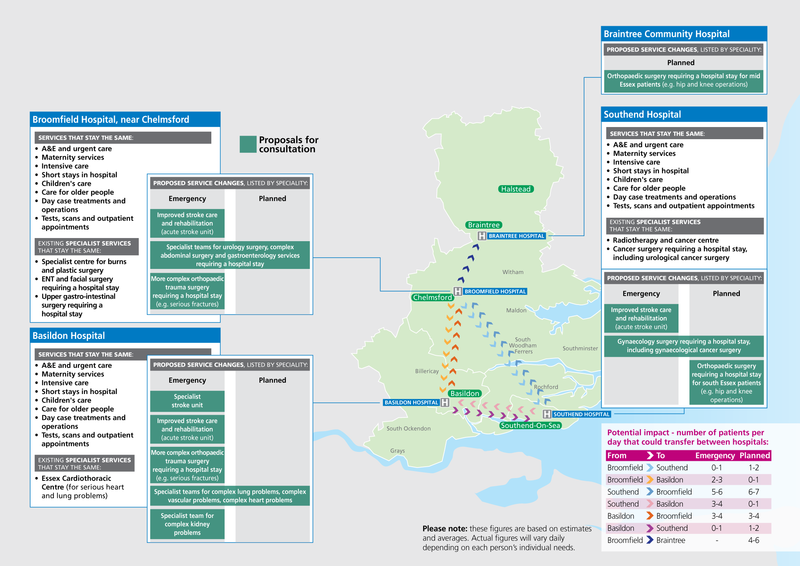 The map below shows services that stay the same at each of the three main hospitals in Southend, Chelmsford and Basildon – details in the white panels. The details in the green panels show proposed service changes, listed by specialty. We also show at the bottom right of the page opposite, an example of the potential impact on patients in terms of the number of people that could transfer between hospitals on a daily basis.